Many people have questions about the World Boardgaming Championships. Here are answers to some of the most frequently asked questions. How are events selected for the WBC schedule? WBC events are not selected by any one person or group but by the membership as a whole using a set formula, statistics from the prior year's events, membership votes in the form of the yearly Membership Drive survey and the co-operation of volunteer Game Masters with oversight by the Board of Directors in the form of Legacy votes and occasional tweaks to the formula. Read further for more details. What is the Century? The “Century” refers to the group of 100 featured game events at the World Boardgaming Championships. 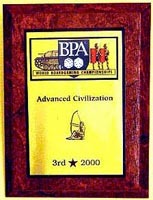 Every Century event is ranked from “2” to “6”; the number is how many places win a plaque—commonly referred to as “wood” in the vernacular of the conference. In addition to an 8-inch shield plaque (all other plaques are rectangular), the winner receives a Centurion t-shirt and many are highlighted on our Centurion poster. Why only 100? Other conventions have more events. Indeed, they do. And so could we if we chose to, but we don’t. Long ago, we decided to emphasize quality over quantity. We have no illusions about being the biggest gaming conference in the world, but some say we are already the best. We believe that, in general, the more events a conference offers, the fewer entrants attend each event. It is simple mathematics. Yet nothing is more disappointing than traveling to a gaming conference to play your favorite game only to find a handful of opponents, maybe not enough for a single game, let alone a tournament. While we like playing games in non-tournament formats, most of us can do that at home without the expense of travel and hotel bills. We crave testing our skills and gaining a sense of achievement. It’s only possible if you can test your mettle against others of the same ilk and see how you fare on an annual basis. We feel that if you go to the trouble to attend, you should be reasonably assurred of drawing as many skilled, like-minded competitors as possible, especially to a conference that draws more people from outside a 300 miles radius than within. Thus, we limit our event offerings to provide focus and the largest possible fields. We feel it is better to have someone not make the trip because their personal favorite isn’t included than to entice them to attend and not deliver the challenge they sought in the first place. Why 100? Why not 110? Why not 501? We had to draw the line somewhere. (Note that over the past few years we have added select “Legacy” events that put us over the 100 limit.) If we didn’t have limits, practically everyone would expect that an exception be made for his or her personal favorite. This number provides sufficient variety to cater to most boardgaming tastes, while presenting gamers with enough hard choices to keep those events viable. Also, by holding the line at 100, the games themselves join the competition—battling with each other for players in an evolutionary test for survival of the fittest. Who decides which games will be so blessed? Our membership votes with their wallets and their feet. The “feet” aspect is determined by actual participation in the event at the preceding WBC. The 100 events which draw best each year among all Century and Trial events are automatically retained as the Century the following year. The rest are culled to make room for fresh blood, otherwise known as Trial events, in the upcoming year. Members on record by the end of December vote to determine which 25 additional Trial events will run in the upcoming year. They choose among games that have been culled, as well as ones that are fresh to the convention. The key to introducing new events is for a member to care enough to be willing to be the Game Master for it and submit an event form for it by November 20 each year, in time to have it included on the annual ballot. Consequently, the answer to the question of "who decides what new games can become an event" is "you" and the membership as a whole. Are these the best 100 boardgames in the world? That is not our claim. These are the games that our members play at our convention. Taste in boardgames varies widely. My favorite could be your selection for the biggest turkey of all time and vice versa. What we have here is an eclectic selection by a diverse group of gamers who have two things in common—they like boardgames and attend WBC. They determine what we play with their wallets and their feet. What about Role Playing or CCGs? The World Boardgaming Championships is all about the competitive play of boardgames. Although we include some	boardgames	that	primarily	consist	of	cards,	we do not include computer games, miniatures, role playing, or collectible card games. Why? Focus. WBC enjoys a remarkable sense of camaraderie among its attendees because they share the same interests. We do not want to dilute that by attempting to offer other forms of gaming which, quite frankly, are done better elsewhere. We are quite happy doing the best we can for those seeking competitive play of boardgames. What determines which games make the cut…pure head count? Yes and No. Events that fail to draw a minimum number of players are culled. That minimum is determined by our Board of Directors based on current WBC attendance levels and whether the event is two-player or multi-player. Among the remaining events, the 25 largest (in terms of head count) are admitted to the Century. The rest are ranked according to a formula based on total player-hours, with the top 75 admitted to the Century. We use player-hours instead of head count to determine Century status because we believe there is value in offering variety—including both long games (e.g., traditional hex wargames) to short games (e.g., Euros and sports games). Using head-count only would eventually reduce the Century to nothing but games with the shortest playing times. Furthermore, we represent both players who spend three days participating in one event and those who participate in 10 short events during the same three days. Why are heats penalized in your fornula? While heats are a useful format device to increase the opportunities for people to play in an event, they are not without cost. GMs tend to schedule more and more heats in an effort to increase their entrant levels. If every one of our 150 events had 4 heats, we would have 600 starting times, just for preliminary rounds. This would severely tax the conference facilities, decrease the size of each heat, and increase the chance that those who qualify to advance to later rounds would not show up to play in those rounds. The bottom line is that an event which takes four heats to draw 20 players is NOT more popular than one that draws 16 without heats. Player-hour penalties are an attempt to check the growth in use of heats. Commencing in 2014 the Century Formula was augmented with additional bonus and penalty points to incentivize and reward GMs who went the extra mile in supporting their event. Those GMs whose After Action reports were judged among the top 10% were awarded bonus points applicable both to Century status and Prize Level. Likewise, GMs who supported their event with extra prizes, website previews, email newsletters, enhanced game accessories, table markers or signin procedures are also eligible for bonus points. Conversely, those GMs whose event reports are late will be penalized points for each 30-day period by which they miss the required reporting date. Similar penalties apply to failure to enforce the convention's various GM rules such as timely submission of winner's lists. Why are some games in the Century (or Trial) list more than once? The same game may be run as more than one event, if the Convention Director and the Board of Directors believe those events are sufficiently different to warrant such an exception and fulfill the other requirements. For the most part, those exceptions are few and growing fewer as attrition eliminates those events which had been "grand-fathered" into the mix many years ago. What games made the Century this year? The Orphans page lists Century events, as well as games eligible to be Trial events. Vendors and Sponsors can add Trial events above the 25 selected by membership vote and thereby provide a constant influx of the latest games. (Note that Trial events must be boardgames in print by Marach 15 of the convention year.) Only events with a volunteer GM who has submitted an acceptable event form by March 15 will be run. What is a Legacy event? By a two-thirds majority vote, the Board of Directors may augment the list of Century events by awarding Legacy status to any non-Century event with a 10-year history of maintaining satisfactory player totals AND GM compliance with all BPA requirements/deadlines. Such events are added to the Century list and retain that status as long as they continue to maintain satisfactory player totals AND GM compliance. Why are prize levels based on the previous instead of current year’s attendance? In order to present plaques at the convention, we need to have them made long before we know how many players the current year’s event will draw. What is a Trial event? A Trial event is any tournament run outside the auspices of the Century. 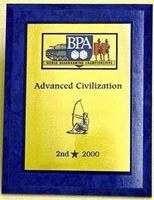 The only BPA prizes for these events are a single plaque for the winner, although GMs and publishers often provide additional prizes. Trial events which draw well are eligible to be Century events the following year. Events eligible to be listed on the Trial Ballot include those run in the previous year that did not make the Century list but which had a minimum number of players (as determined by the Board of Directors). In addition, if someone offers to GM an event and submits an acceptable Event Form for it by November 20, that event is listed on the ballot. Only the 25 Trial events receiving the most votes on the ballot are listed as Trial events. Only those with a GM by March 15will be run at the convention. Any openings in the schedule may be filled with Alternates, those Trials with confirmed GMs that were not among the top 25. Sponsors and Vendors may also add Trial events to the schedule. Why must we wait for our Centurion shirt? Not only are these shirts a nifty looking and unique souvenir that is unavailable to the general public, they also allow winners to do their boasting in a quiet, politically correct way. The drawback is that—unlike plaques—the shirts cannot be made in advance, since we do not know who is going to win them—and, thus, what size they need to be. Thus, they have to be made after the convention. A $5 token fee is charged to ensure that they won't be used as a cleaning rag just because they were free. The shirts are then picked up at the next WBC or can be mailed within six weeks for a shipping charge. Is winning too much an emphasis at WBC? Many people ask whether it should be about “fun” or getting “wood"? It all depends on your point of view. We have designed this conference as an opportunity for gamers to demonstrate their prowess in their favorite games. We fulfill that role better than anybody else on the planet (our Yearbook and the rest of our web site testify to that), and we don’t apologize for that. It is what attracts players from across the world to attend, not the prospect of a friendly game they could just as easily get at home. Further, we don’t believe that an emphasis on winning and on considerate behavior are necessarily mutually exclusive. However, we do believe that incentives for winning should be limited to “braggin’ rights” type prizes. Even small monetary prizes tend to bring out the worst in some people. We think its possible to have fun in the quest for wood without ruining someone else’s day. Others seem to think that a desire to win in some way ruins the experience for them. Yet the objective of most games is to “win”, anything else would be awfully boring. Indeed, what most people value about WBC is the camaraderie shared with one or more able opponents as they attempt to thrash each other in their favorite game and inevitably settle for the white knuckle ending that they can enjoy reminiscing about afterwards. Further, we would like to think that someone can enjoy this pursuit without someone else taking offense at, or putting down, what he or she enjoys. Still, keep in mind that players at WBC are welcome to sample many games rather than master one. They are not required to be experts, which is why we offer Class ‘A’, ‘B’ and ‘C’ events. Furthermore, our Open Gaming opportunities—augmented by a 13,000 sq. ft. tiered dinner theater and large lending library are excellent by almost any standard. 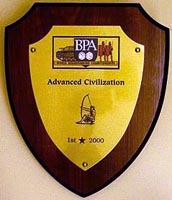 Why are prizes limited to plaques and t-shirts? We’ve always outlawed cash prizes. The only monetary awards we give are free lodging for our Top GM and our Sportsmanship winner. Both of these awards can only be earned through sacrifice. In fact, we pride ourselves on the fact that Sportsmanship is an emphasis at WBC. There are always occasional jerks with the wrong priorities, but that is true in any venue, whether it involves tournaments or open gaming. We believe part of the reason for our great record in that area is the lack of financial incentive in our prize policy. We play for braggin’ rights and symbols thereof. Note: Some events offer merchandise credits that have been donated by manufacturers. Although we are happy to award these certificates, we do not request them for the above reasons. We have repeatedly polled attendees about whether they would prefer merchandise credits instead of secondary plaques as prizes. Nearly 60% opt for the extra wood. Must I be an expert to participate in Events at WBC? We offer several classes of events. Class ‘B’ and ‘C’ events (color-coded Yellow and Green) are specifically designed for both experienced and inexperienced players. Class ‘C’ events are Coached. The game is taught during or just prior to events. The GM may also schedule Demos, which are listed in the schedule. This class of event is specifically designed to introduce new players to the game. Class ‘B’ events offer Demos at a specific time listed in the schedule. Rules are not explained during the event, but experience is not necessary. Class ‘A’ events (color-coded Red) are for Experienced Players Only. Rules are not taught before or during play. Even experienced players could benefit from a quick refresher at scheduled Demonstrations. May I play a Class ‘A’ event even if I have never played the game before? If you know the rules (or can get someone to teach them to you), go for it. The public is often unduly intimidated by competition. The fact of the matter is that no one ever bettered themselves in any endeavor without getting beat along the way. The best teacher is observing the tactics of more experienced players first hand. So what if you lose? You’ll come out of the event a wiser player than you entered it. Today’s loser is tomorrow’s champion in the making. Will the program be mailed to pre-registrants in advance? No. Both the program and the Yearbook (highlighting last year's conference and the BPA year in review) can be picked up at WBC when you check in for your badge. Yearbooks must be purchased separately for those not qualifying for them based on early membership commitment. Both are also available to be downloaded from our web site a month before the convention. Why do you always schedule my favorite games opposite each other? With over 150 events and less than a week to complete them, overlap is inevitable. If we moved Game X to accomodate you, we doubtless would cause another conflict for someone else who does not want it scheduled opposite Game Y. In any case, we do not schedule events—the individual GMs do. Events are run by volunteers whose main motivation is often the ability to set the times to accomodate their own schedule. While we make suggestions, we do NOT determine when games will be run. Aside from slight adjustments to facilitate efficient use of the facilities, each GM picks their own schedule. So, if you want more input into the schedule, be a GM and then others can criticize YOUR choices. GMs who wish to avoid overlap with similar games should contact other established GMs of the games in question to co-ordinate their proposed schedules before submitting their Event forms. This information is readily available on this website and by request. To facilitate this advance planning, the Orphans page contains the requested time periods of all submitted events as soon as they are known. Do not request changes of any type after the March 15 deadline. Such changes after the scheduling is complete and published as a matter of record always have a domino effect that causes more harm than good. Who can be a GM? Read the GM Guidelines. Anyone who runs an event has until Dec. 31 of the following year to claim the event again if he or she has satisfactorily fulfilled all GM duties. After that, the event is open to any volunteer submitting an acceptable event format. The Orphans page lists all events, whether or not they have a confirmed GM, and any times requested by the GM. Is WBC really an international convention? Is the World Series? The World part of World Boardgaming Championships speaks for itself. We have more members from the United States than any other country, and many of them come from the Mid-Atlantic region; however, many of our members travel from across an ocean to attend. In 2013, we welcomed residents of no less than 18 nations and nearly all of the 50 states. Our charter for forming this organization was to be the best competitive boardgaming conference in existance and safeguard the expectations of the national or international traveller. It remains our No. 1 priority. We do not expect to move outside the Mid-Atlantic region any time soon, due to the logistical problems such a move would entail, plus varied problems such as GM availability, conflicts with local conventions, attendance projections, and finances. In any case, WBC is committed to Lancaster Host through 2015.